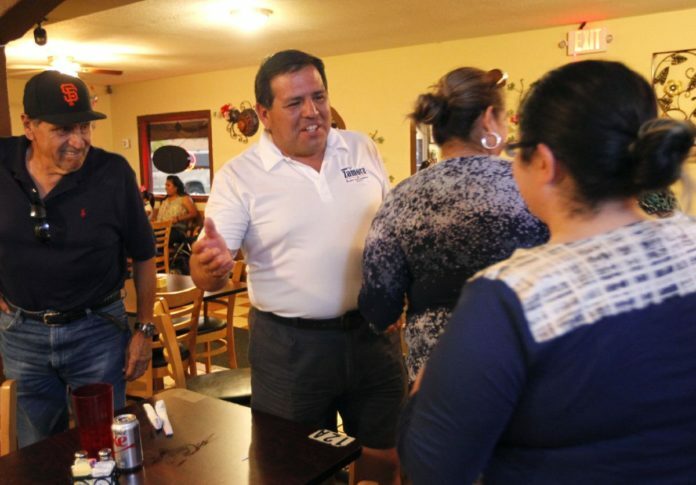 McALLEN – Despite one incumbent winning re-election, another fell Saturday as District 2 Challenger Joaquin “J.J.” Zamora took down Commissioner Trey Pebley. Zamora won unofficially with 1,004 votes to Pebley’s 555 (64 percent to 36 percent). It is the first time an incumbent lost a city of McAllen election since Othal Brand lost to Leo Montalvo in the 1997 mayoral election. Pebley acknowledged that Zamora ran a good race. It was both Zamora and Pebley’s first campaign, as Pebley ran unopposed in 2013. Zamora, an Hidalgo County assistant district attorney, ran a low-cost, grassroots campaign compared to Pebley’s, which was backed financially by several in the business and construction community. Zamora also rode his name recognition thanks to his family’s restaurant, Zamora’s, on North 23rd Street between West Dove Avenue and Lark Avenue. Zamora block-walked most of District 2, which covers much of northwest McAllen. He said he felt many in District 2 didn’t know who their commissioner was, and he could change that. He also said it was important to vote with how his constituents feel, not just because the entire commission is voting a certain way. Pebley knocked Zamora for his lack of public experience, but Zamora said his job as the assistant district attorney is precisely working for the public. Zamora has said he respects Mayor Jim Darling, who just won re-election. However, he said he is not afraid to stand up and vote no. Several political advertisements paired Zamora with mayoral challenger Othal E. Brand Jr. as a slate running together, but Zamora denied any kind of slate. Zamora said the two are friends, but they were not running together. Zamora will join District 3 Commissioner Omar Quintanilla as new commissioners. Quintanilla will replace Hilda Salinas, who is retiring after 16 years on the commission. Zamora keyed in on connecting to the community, which he acknowledged is easier said during campaigning than done while on the commission. Pebley said he wouldn’t change anything he did during the campaign — Zamora simply did a good job. “I think District 2 is in good hands,” Pebley said.